The STANAG standards are published by NATO to provide common military or technical procedures for NATO members. Some are publicly available in NATO’s online library. 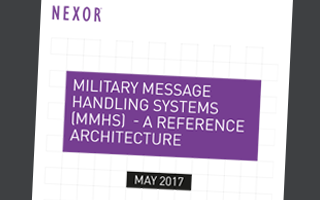 They provide many of the standards used in Military Messaging Handling Systems (MMHS). STANAG 4406 v2 is the Military Message Handling System (P772). Find more information on our MMHS capability. If you would like to talk to us directly, you can request a call back. Copyright © 2019 Nexor All rights reserved. Nexor, SIXA and CyberShield Secure are registered trademarks of Nexor Limited. Registered in England, No. 05152465.